Ralphs at 910 Lincoln to be Remodeled - Yo! Venice! 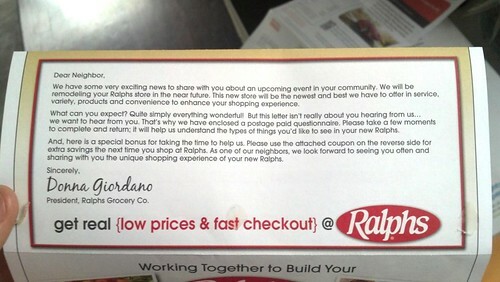 Just about fell out of bed this AM when an email came in from Joe S. letting us know that the Ralphs grocery store at 910 Lincoln is going to be remodeled. Known by various nicknames (I call it Fellini Ralphs), the location will be all shiny and new for the occupants of the Lincoln Place apartment complex. As noted by my favorite Facebook page, “Delta Bravo Urban Exploration Team“, Fellini Ralphs was used as a location for the film The Big Lebowski in 1997. Do yourself a favor and add Delta Bravo by clicking here!